Favorite Time of year to go to Disney – August: End of August has light crowds and it’s a fun and crazy way to transition into the school year. It is HOT, but we love the waterparks and its super easy to pack! I went on my first trip to Walt Disney World when I was 6 and it was love at first sight! Since that first visit, my husband and I travelled two more times before we had children and had a blast. Disney is definitely a different experience without kids. In the past 10 years, we have taken our children, ages 14, 12, 6, and 4 a half dozen times. I have travelled with nursing babies, toddlers, kids, preteens, teenagers, adults, and grandparents. Disney truly has something for everyone! Disney’s customer service is top-notch and I have not once had a poor experience. 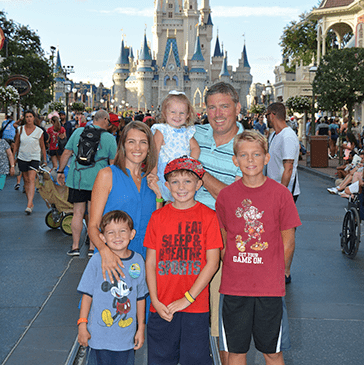 My goal in being a Mouse Magic Travel planner is to help other families experience that Disney magic!